These Salted Caramel Oatmeal Cookie Bars came into existence one day out of sheer desperation for an oatmeal-butterscotch cookie. Since I have yet to come across an oatmeal cookie recipe which works here at high elevation without melting all over the cookie sheet, I thought, Why not contain the whole mess in a pan and make oatmeal-butterscotch cookie bars instead. With the plan in order, and the oven preheating, I sadly realized that there were but a mere tablespoon of Vermont Nut Free butterscotch chips left at the bottom of the bag. Enough for garnishing a bowl of ice cream, but certainly not for adding to my cookies. And since virtually all butterscotch chips in the grocery stores are processed with peanuts (actually I haven't found one that's not), I had to improvise. Butterscotch and caramel are essentially the same thing - butter, sugar, and cream cooked together to varying degrees of doneness. The only technical difference being that caramel is generally made by caramelizing white sugar while butterscotch is made with brown sugar. I, however, have always made caramel with dark brown sugar and prefer its deep, molasses-y bite. I decided to douse my oatmeal bars in a thick, salty layer of caramel. Indulgent? Yes - but I had high hopes of combining the two classic flavors into one supremely decadent dessert. It was clear after one bite, however, that "decadent" was an understatement. These are sinfully rich, lusciously chewy, and satisfyingly salty. The ultimate oatmeal cookie to transcend all others. Cook the caramel to the 'soft ball stage' and it will stay creamy for days stored in the refrigerator. The caramel recipe is an adaptation of the caramel layer used in these Espresso Caramel Bars, and calls for cream; however, more often than not I use half and half which works just as well. The oatmeal bars are a cookie recipe that I've been following for years. You'll want to cut these small - they're an intensely satisfying taste of happiness in just a few small bites. An 8 x 8 pan should make between 16 - 20 bars. 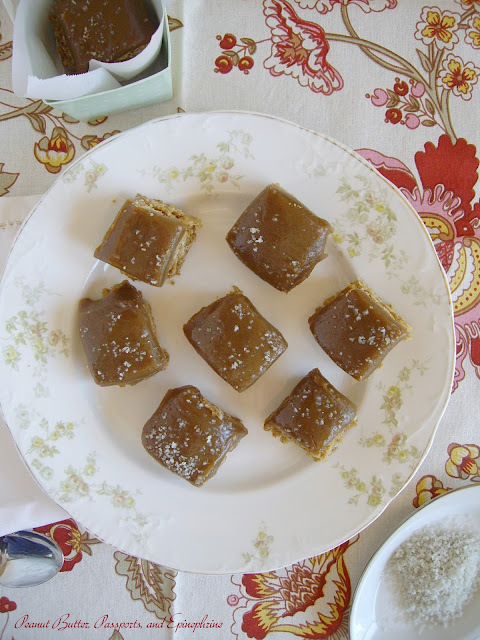 - if you don't have a candy thermometer carefully drop a bit of the caramel syrup into a glass of ice water. Remove the cooled caramel with your fingers. It should form a ball but still be malleable when pressed between your fingers. - choose a small sauce pan so that when you insert the candy thermometer the syrup rises to the 'immersion point' (this should be marked on the thermometer). If the level of the syrup doesn't reach the immersion point, cook the caramel until it is just under the 235 F degrees. Otherwise the caramel will be overcooked and hard (like toffee). 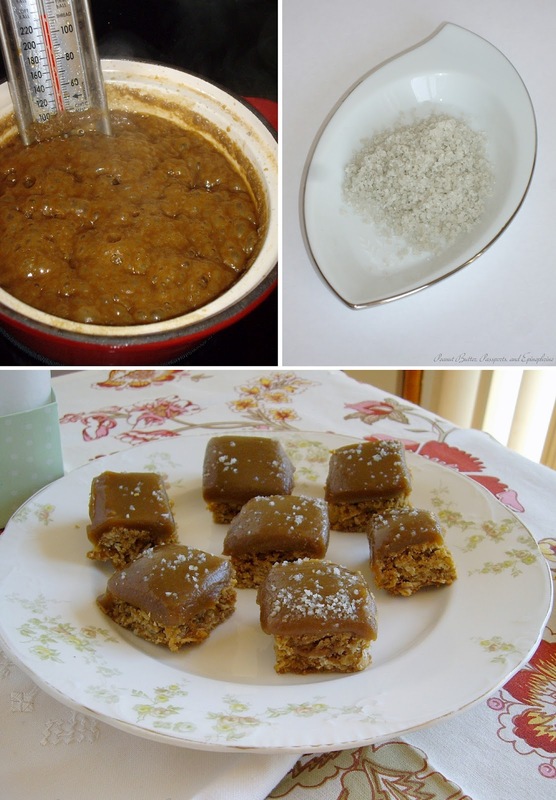 - insert the candy thermometer into the pan while the mixture is relatively cool and stir very carefully and gently. Otherwise you risk breaking the thermometer. There's nothing worse than throwing out an entire pot of caramel with shards of broken thermometer in it. Preheat the oven to 350 F (175 C). Butter a 8 x 8 inch baking dish and line with parchment paper on bottom and sides (leaving a little overhanging to act as handles when removing the bars from the pan). Butter the parchment paper and set aside. In a medium bowl whisk the flour, baking soda, baking powder, salt, and cinnamon - set aside. In a large bowl beat the butter with the sugar. Add the egg and vanilla and beat until combined. Stir the dry ingredients into the wet. Fold in the oats. Spoon the dough into the prepared pan. With lightly damp fingers press the dough evenly into the dish. Bake for 20 - 23 minutes until lightly golden. Allow to cool in the pan while making the caramel. Place the cream, butter, sugar, and water in a heavy bottomed sauce pan over medium heat. Insert a candy thermometer into the mixture and stir gently until the butter melts, the sugar is dissolved, and the mixture begins to bubble (being careful not to bump the thermometer). Let the mixture boil, without stirring, for 6 - 9 minutes until it reaches the 'soft ball stage' at around 235 F (113 C). Very carefully, wearing oven mitts, pour the boiling caramel over the cookie bars in the pan. Allow the bars to cool for 20 minutes, then sprinkle the salt evenly over the caramel. Cool completely in the refrigerator or freezer before cutting and serving. Store tightly covered in the refrigerator for up the 5 days. Thanks, Mimi! You're right, it does feel like a minefield sometimes, but I'm up for the challenge - especially when it involves cooking. I hope your kids enjoy the cookie bars. Mine like to deconstruct their's by peeling off the caramel and eating it separately. Oh well! Have a wonderful day! What a wonderful wholesome treat! 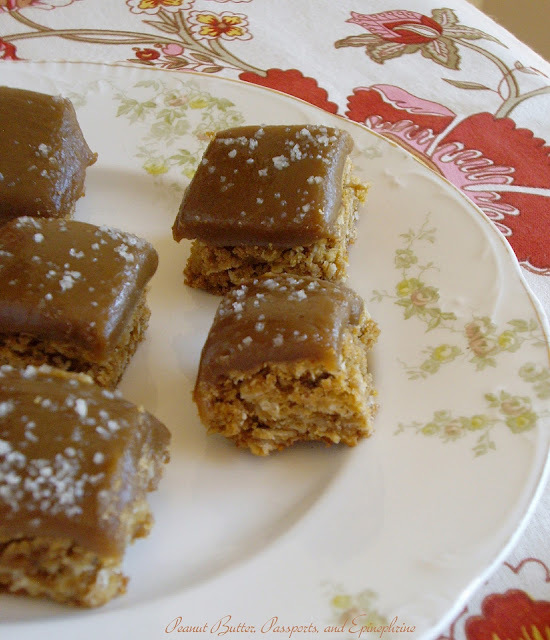 I love oatmeal cookie bars and adding salted caramel is such a great idea! Thanks so much for featuring me, April! Have a lovely day!